Green is the color of spring, nature, life and new beginnings. My favorite green stone is malachite because its opaque, multi-tone gradations remind me of the treetops of a forest or newly- cut lawn. It’s an added bonus that like most green stones, beautiful malachite is associated with wealth and success, which is excellent for entrepreneurs, business and career women. Whenever I’m selling my waist beads at a craft show or vending event, it’s always empowering to wear my malachite waist beads! And if that’s not enough, malachite is a healing stone, a symbol of creativity and transformation, and it corresponds to the heart chakra, making a way for peaceful, loving relationships. So, let’s see. That’s money, love, health and peace. What more can a woman ask for? Generally, malachite is a bright leaf green or dark olive stone with black or yellow bands, like agates. It was named after the mallow, one of the earliest healing plants mentioned in recorded literature. From ancient times to the 1800s, malachite was used to give paint its green pigment. Malachite was used as a mineral pigment in green paints from antiquity until about 1800. It is mined from Russia, Africa, Western Europe, Mexico, Israel and Arizona in the U.S. 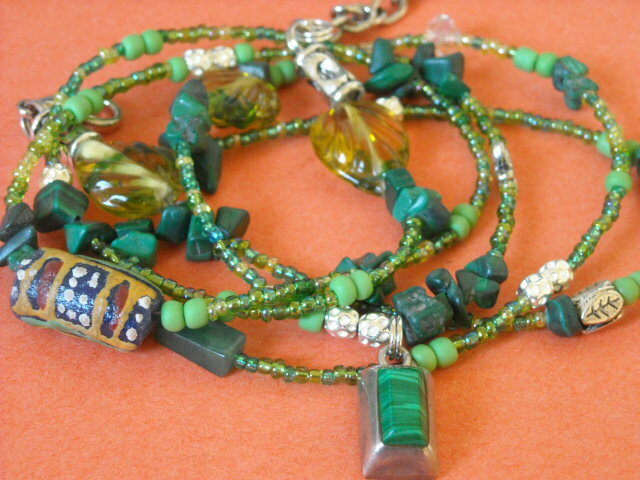 In addition to bringing wearers business success, malachite also helps you avoid unsavory financial deals. It is believed to guards travelers from accidents and protect children. In her book “Sacred Woman,” Queen Afua associates malachite with the spiritual aspect Het-Heru, and recommends that pregnant women wear the stone to shield the unborn child. In the days of the ancient Egyptians, Greeks and Romans, the stone was ground up and mixed with ground lapis lazuli as eye shadow. It was also used in amulets and jewelry. Because of its beautiful green color, malachite has a calming, restful energy. It works with the central chakra, the heart. Its vibration allows you to expand and grow, enhancing health and spiritual dimensions. Excellent for attracting love into your life. This is a wonderful stone for women and perfect to add to your waist beads. Try to stay aware of the energy of the stones that you are placing around your body. Keep your spirit light and vibration high!